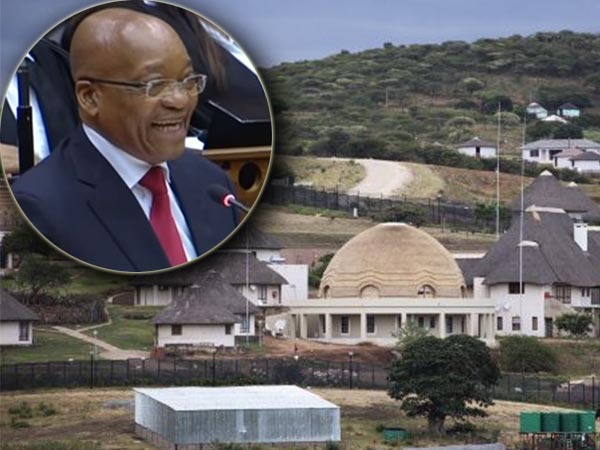 The presidential residence in Nkandla, KwaZulu-Natal, is imprinted onto the minds and tongues of every person on the street. But with the release of Police Minister Nkosinathi Nhleko’s Nkandla report on Thursday, some people have been left scratching their heads in confusion and wonder. 1) The fire pool (yes, we can use that term because Nhleko did) is beautifully adorned with blue mosaic tiles, steps and a safety net. Overdressed? Not quite, because: recreation. While the pool’s primary use is for firefighting, it was also conceptualised as a swimming facility for surrounding communities. But our police minister does not know whether children have yet been allowed into the pool. We hope Number One didn’t have a pool party without them. 2) Don’t call the local Nkandla fire and rescue services in an emergency if you want to live - even if it is to the President's homestead. It took them an hour and 10 minutes to respond to the Head of State's test call for help. They responded with a "measly" single-cab bakkie, a thin hose and a pump that had to be manually started. And one of the firefighters had freshly-applied pink lipstick on. She clearly made the effort, unlike the fire officials who thought: “just a house”. 3) The so-called "amphitheatre" is actually tiered soil retention walls, but it was designed with large grass steps so that it looks like an amphitheatre. But remember that it’s NOT an amphitheatre because the steps contain aloes and an irrigation system. Nhleko even said it would be “unimaginable” for people to sit on these steps. And proceeded to show a photo of a casually-dressed man sitting on the steps, his takkies dangling above the floor (He looked pretty comfortable to us?!). 4) The "amphitheatre" is the emergency assembly point for the family and homestead dwellers. But they’ll have to stand, not sit. It’s also a place for police and emergency officials to brief and debrief. However, they won’t have a stage to stand on. They better not screech “hear ye, hear ye?” for fear of turning the space into a theatre. 5) Number One’s kraal or isibaya is not just for animals, but also a sacred and cultural place that his family built. While his family conceded to the animals being moved to a new enclosure for security reasons, they did not concede to completely removing the kraal. Culturally, it is not permissible to relocate the kraal within the homestead and if it has to, a ceremony must be performed to explain to the ancestral spirits why it is being relocated. It may also lead to re-positioning houses within the homestead so that the kraal is centrally situated. Phew. 6) Nkandla is not just home to the country's president, but also a welcome abode for free-range chickens, or as the Minister called them, free running chickens. Clearly the concept of being free is not limited to freedom fighters, born-frees and those freely gathering at the amphitheatre. 7) Even those pesky cattle and people constantly setting off false alarms are not discriminated against. Not too sure about the humans, but the cattle got a new enclosure with a separate entrance - safely out of reach of the motion sensors. 8) The new, improved security features are sure the keep the President and his family safe - as long as his security officers don't "ignore false alarms or switch off the system", per the ministers report. Would be bit of a waste then, would it not? 9) Nkandla is also a great place of learning - Minister Nhleko drew on Wikipedia for a definition of an amphitheatre, explaining it meant a place of entertainment and enjoyment. Who knew? 10) As National Key Points go - the pressure is off the media to try and get footage or a video of it and risk being arrested. Being a man of the people, the President's men did it all for us, albeit to the strains of O Sole Mio.